Click the Download button. You will see a pop up with your download progress in the lower left corner of the Chrome web browser. 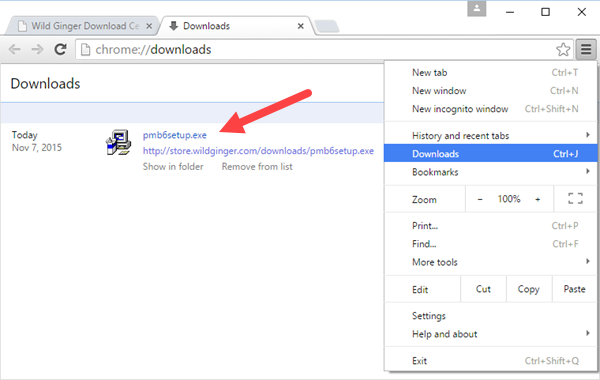 Once the download has completed, open the Chrome Downloads folder from the menu icon in the upper right corner of the Chrome screen and double click on the file to begin the installation. Click the Download button. You will see a pop up with your download progress in the lower left corner of the Edge web browser screen. Once the download has completed, click Run to begin the installation. Click the Download button. You will see a pop up dialog box to Save File or Cancel. Click the "Save File" button. Once the download has completed, open the Firefox Downloads folder from the Firefox Downloads Quick Access icon in the upper right corner of the Firefox screen and double click on the file to begin the installation. Click the Download button. You will see a pop up dialog box along the bottom of the Internet Explorer web browser screen.